When young journalist Hugh Miles moves to Cairo, his intentions are clear cut, to finish the book he is writing and explore the city. He doesn’t expect to become a friend and confidante to a group of young Arab women who welcome him into their weekly card game, and their lives, sharing with him their hopes, dreams and fears. While the women cut and shuffle, Hugh listens to their stories and learns about what it means to be a young Muslim woman, dating dieting and divorcing in a country where traditional Islamic values are in the ascendant. Yosra juggles her duties as an only daughter with an addiction to prescription drugs; Nadia copes with an abusive husband; Reem comes to terms with plastic surgery gone wrong; and her sister conceals her secret love from her family, whilst attempting to breathe life into a clothes shop run by a regime apparatchik with an Islamist vision of retail. 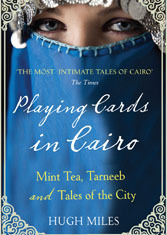 Playing Cards on Cairo is a fascinating sideways look at the lives of young Egyptians that takes Hugh Miles on a romantic adventure that will lead him to Islam and bind him to the Arab world forever.